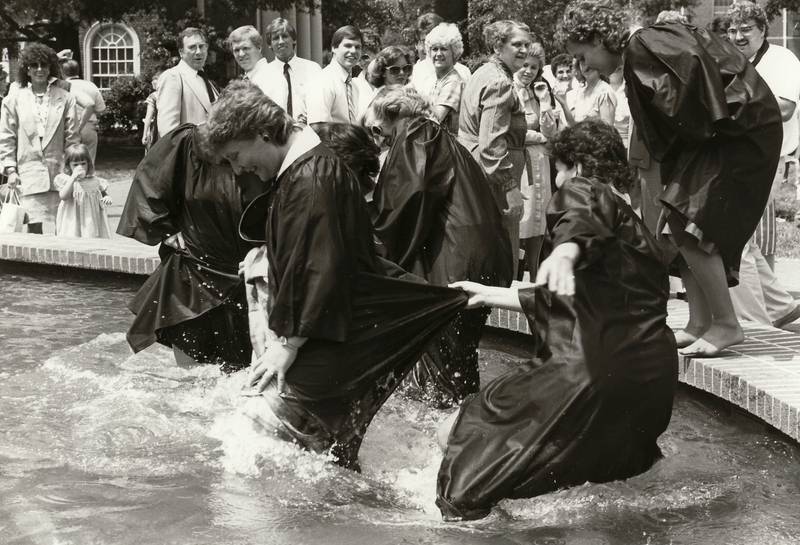 Today, Elon students are not allowed to splash or wade in Fonville Fountain after receiving their diplomas during commencement, but in the 1980s, this was a well-embraced Elon tradition on commencement. Students celebrate after receiving their diplomas in 1986. Fonville Fountain was constructed in front of Alamance Building in 1982. It was a gift from Rudy M. Fonville and Frances Turner Fonville, class of 1928. Mr. Fonville was with the Burlington Daily Times-News. The 1986-1987 Elon Student Handbook was the first year a policy was established in regards to swimming in the fountain. Section 22 of the handbook is designated for “swimming in restricted areas.” According to the handbook this is defined as “swimming or wading in Fonville Fountain or Lake Mary Nell.” From 1982-1986, there was not a policy that prohibited students from swimming or wading in the fountain. This year’s commencement for undergraduate students will take place on May 22. Laith al-Majali, a 2005 graduate will be this year’s commencement speaker. Needless to say, no one will be splashing around in any of the fountains on campus. In addition to commencement for undergraduates, Elon will also hold commencement exercises for the MBA program, Elon School of Law, and its inaugural class in the iMedia graduate program. This entry was posted in Campus traditions, Cultural events, Student Life. Bookmark the permalink.